A House of Lords report has condemned HMRC’s efforts in tackling tax avoidance and evasion, while calling for Government to establish a review of the taxman’s powers to ensure future fair treatment of taxpayers. 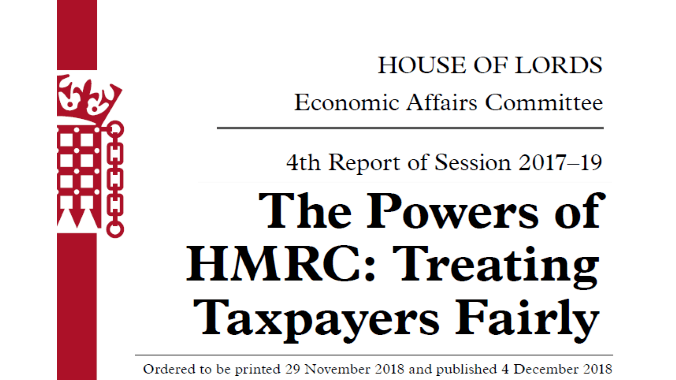 Launched by the Economic Affairs Committee, the report, titled The Powers of HMRC: Treating Taxpayers Fairly, urges Parliament to rethink how it holds HMRC and the Treasury to account for the fair treatment of taxpayers. This, it argues, is warranted by “a compelling need to address the view that HMRC is not sufficiently accountable”, which was shared by many who provided evidence during the inquiry. “HMRC is right to tackle tax evasion and aggressive tax avoidance,” noted Lord Forsyth of Drumlean, chairman of the Select Committee on Economic Affairs. “However, careful balance must be struck between clamping down and treating taxpayers fairly. Oversee the issues around HMRC culture and deteriorating customer service. “This recommendation is very much welcomed,” comments ContractorCalculator CEO, Dave Chaplin. “We desperately need oversight of HMRC to deliver accountability and fairness for taxpayers. Is HMRC’s abuse of power surprising? Throughout the inquiry, the Select Committee heard multiple accounts detailing HMRC’s abuse of its powers, which the report notes have contributed towards “increasingly aggressive behaviour towards taxpayers”. “In a ‘rule of law’ democracy, the protection of the people from bureaucratic abuse relies on independent Government bodies cross-checking each other’s actions to limit abuse of powers. Among the powers discussed during the inquiry was the contentious April 2019 loan charge, of which Lord Forsyth described HMRC’s approach as “disturbing”. Contractors will welcome the Select Committee’s recommendation to amend the legislation to exclude loans made in years where taxpayers disclosed their participation in these schemes to HMRC, or which would otherwise have been ‘closed’. How will Government respond to Lords findings? Considering the preventative impact of the report on HMRC’s plans to extend the Off-Payroll rules to the private sector, Webber is more optimistic: “HMRC may be forced to reconsider Off-Payroll, but only if a lot of work is done to expose the link between the original IR35 iteration and HMRC’s reaction to the use of schemes to avoid the uncertainty. As the report acknowledges, engagement in loan schemes has often been triggered by factors outside of the control of the individual taxpayer, including aggressive tax legislation. “Nobody wants aggressive tax avoidance, but the catalyst that results in these schemes is aggressive tax legislation enacted by HMRC, including IR35 in April 2000 and its ghastlier sequel, the April 2017 Off-Payroll reforms. The response by taxpayers is hardly surprising.